Join us in this new venture where community members and groups come together to test ideas and actions that build a vibrant downtown and a great city. Like the idea – but not sure how you want to participate? Come visit, tour the space, and talk with us to learn about the many ways you can contribute. Or contact us to discuss opportunities at info@shastalivingstreets.org / 530.355.2230. YOU ARE INVITED TO OUR EVENTS AND ACTIVITIES! Learn the basics of the German language with no past experience necessary. Between 12am-6pm a Melee Mural will be erected and displayed, there will be interactive salmon art projects for children, and Winnemem Photography displayed. 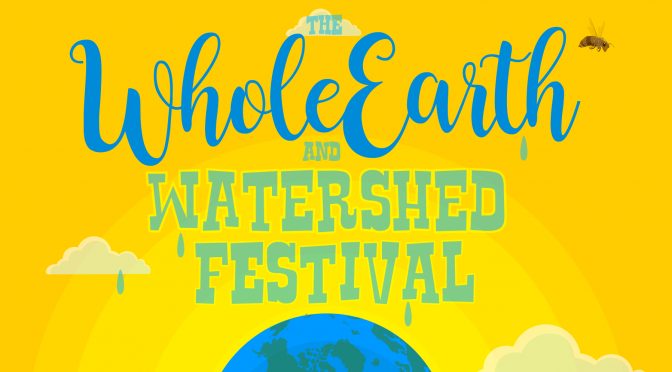 Vendors will include: Winnemem Jewelry/T-shirt sales, Ron’s Chico Bike Shop bicycle furniture, Native Roots Network, Women’s Health Specialists, Wild and Science Film Festival, and interactive salmon support projects. 3:45-4:30pm Hip Hop performance by Stewie G.
Free and open to public! Will be showing a different movie each time. Bring friends and family to enjoy games, art, and kids programming. North State Symphony – Conduct Us! More information in this overview document, with participation and pop-up vendor information. Activities and prototypes as well as shows and entertainment are designed to help people connect, contribute, address challenges and have fun together. These guiding themes are open to interpretation and broad enough to leave room for a wide range of topics, activities and speakers. Contact us with questions or to discuss your ideas. We look forward to hearing from you! MarchFourth returns to Redding for a Downtown Fall Festival! MarchFourth is a joy-inducing force of entertainment. The colorful explosion of brassy funk, rock, and jazz is all about the groove. 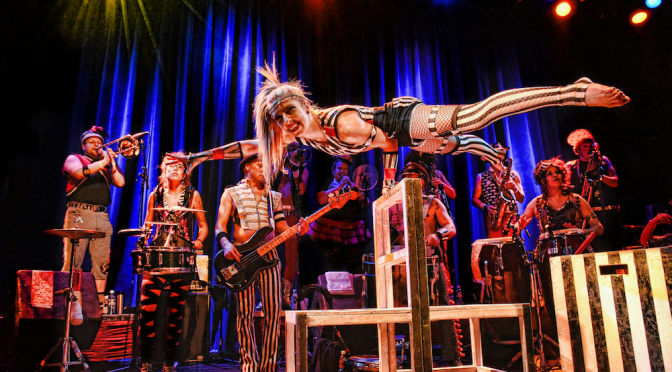 This larger-than-life group of musicians and acrobats tours the country year-round, bringing a spirit of celebration wherever they go. MarchFourth is, in a word, FUN! This is a big-band show not to be missed. Join us! Major 7th was formed three years ago by members of the Shasta High School Jazz Band. This summer they have been featured in a number of local festivals. Members of Major 7th are big fans of MarchFourth. They also have a female sax player in Emily Stolz. Members are: Jacob Akana, Emily Stolz, Rob Trent, Daniel Lindberg. We invite you to dress-up in your carnival, halloween, fall-festival finest! It’s October, it’s beautiful in Downtown Redding, and this is a new way to get together with friends and family and have a great time. Adults $25 Advance. $30 day of show. Day-of-show tickets at the entry gate. $30 Adults / $10 for students. Doors open at 5:00. Enjoy music by Major 7th & festival activities. MarchFourth show starts at 6:30. 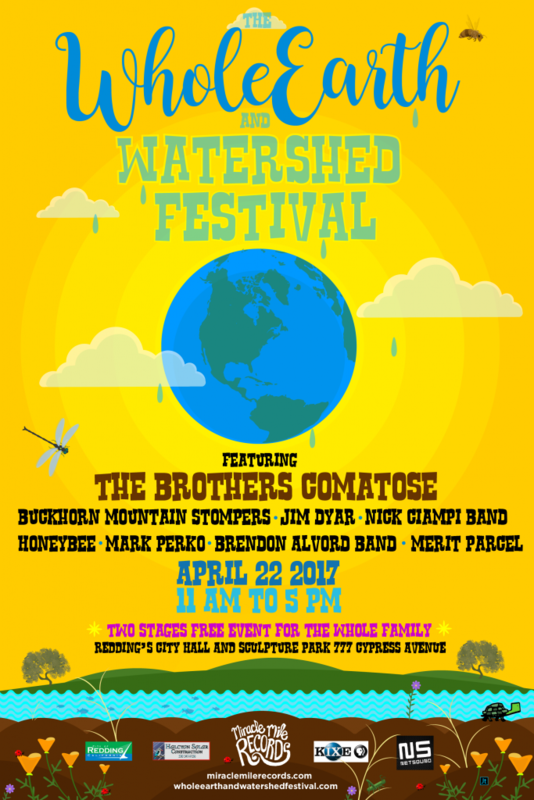 This show presented by Shasta Living Streets, Jefferson Public Radio, Miracle Mile Records, and Redding Roots Revival Music Festival. Proceeds support Shasta Living Streets programs to build prosperous communities by creating better bikeways and trails, walkable cities and vibrant public places – where active living excellence brings a strong and secure economy and enables all people to lead healthy and joyful lives. We are excited to announce that we have received a grant from TheMcConnell Foundation to serve as Activation Lead for Downtown Warehouse Activation! This is located in the the renovated warehouse at the site of the former police station in downtown Redding. Demolition is nearing completion, and the effort to salvage a portion of bricks has been successful. The project was originally dubbed The Green Door Project for the distinctive green doors that have also been salvaged. 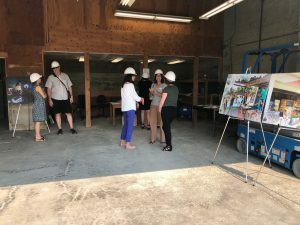 Now, as warehouse renovation nears completion to launch as early as September, the project has taken on its official name: California Street Labs. The McConnell Foundation has made a ten year commitment to downtown revitalization. We begin with California Street Labs, a project that is temporary by design. 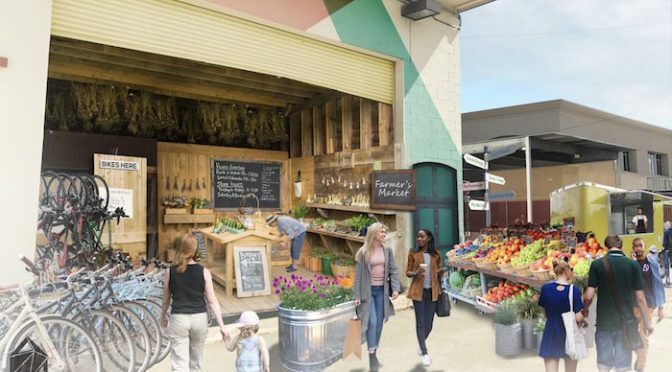 Leveraging the tools of tactical urbanism, this project is intended to invite the public to experience a sampling of what is possible in a vibrant downtown. – Rachel Hatch, Program Officer for Community Vitality with The McConnell Foundation. The Foundation is working with community groups to activate the warehouse. To activate means to program the space with people and objects to enliven it. Today, the Foundation announces a grant to Shasta Living Streets, who will serve as the Activation Lead on the effort. This builds on Shasta Living Streets’ successful 2015 pop-up venue, Market Hall at 1729 California Street (described in Enjoy Magazine, August 2015 here http://bit.ly/2AXf9g4). It is more important than ever to give our community a place to participate and connect. We see this as a bright spot in our city as downtown development projects and community revitalization are underway. – Anne Thomas, Executive Director of Shasta Living Streets. Examples of activities that will happen in the space include: art installations, pop-up retail, music performances, film screenings, bike-related activities, meet-up groups, and more. Community participation will revolve around 7 key themes: Civic Life, DIY (Do It Yourself), Future City, Real Play, Science & the Natural World in the City, Culture, Arts & Entertainment, and New Economy. Drop by 1313 California Street, meet the team from Shasta Living Streets, tour the space, and learn how to take part in this exciting endeavor. 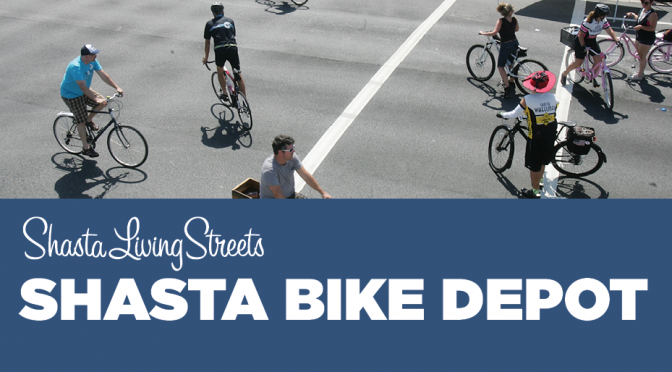 About Shasta Living Streets: Shasta Living Streets is a local organization that since 2010 has been dedicated to building better bikeways and trails, walkable cities and vibrant public places in Shasta County. Two years ago we spearheaded a collaborative project & raised funds. There is happy news to report – Remember when we said this? 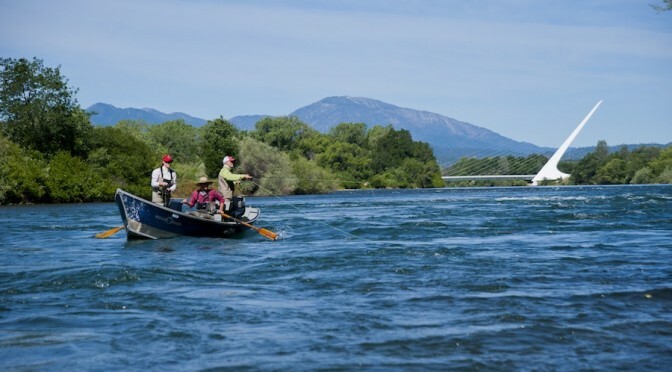 We call this the Redding Riffle project because of the very important fish habitat in the river adjacent to this area. Thank you to our members and supporters and to the collaborative organizations. Do you want safer streets for walking and bicycling? Would you like the Redding City Council to continue to prioritize efforts to improve the safety and accessibility of streets and neighborhoods? Your voice counts. The Redding City Council is asking for input. Help ensure this serious safety issue continues to be a priority for the City of Redding. Contact information below. Traffic deaths and life-altering injuries from collisions are preventable. For too long we’ve considered traffic deaths and severe injuries to be inevitable side effects of modern life. We face a crisis on our streets — with traffic violence taking too many lives, both from collisions and from sedentary lifestyles. The significant loss of life exacts a tragic toll, extending beyond personal loss to deep community impacts, including: personal economic costs and emotional trauma to those suffering; and significant taxpayer spending on emergency response and long-term healthcare costs. And because so many fear for their safety on our streets, there is no real transportation choice for our families — no right to choose to walk or bike — and, as a result, we compromise our public health with increasing rates of sedentary diseases, higher transportation costs, traffic congestion and pollution. We can save lives, prevent life-altering injuries, increase physical activity, reduce the high cost of transportation for local families, and improve the livability of our community and the strength of our local economy. People in Redding from all walks of life -staff in the City of Redding and Shasta Regional Transportation, as well as businesses, developers and community groups are attempting to address this problem. We want to ensure that their work to make streets safer for all modes of transportation continues to be a priority so they can move forward with reliable data, resources, and political support. City Council wants to know what safety issues concern you – and what solutions you would like to see addressed. Please send a respectful email with your concerns for safe bicycling and walking in Redding, generally, on with specific detail. We want to register the communities interest to continue addressing this serious safety issue. Emails and will be provided to the City Council prior to the forum. Email questions will be addressed at the forum as time allows, and may be addressed in subsequent materials. In addition to the City Council, Redding Police officials will attend, as well representatives of Shasta County public safety agencies. The forum will include background information on what the City has done, and is able to do, to combat crime, including a rundown on ordinances the City has enacted to protect the public. Each year, more than 30,000 people — the population of a small city — are needlessly killed on American streets and thousands more are injured. We call this suffering traffic “accidents” — but, in reality, we have the power to prevent traffic collisions. The Festival features over 135 innovative exhibitors with interactive, educational fun for the entire family, give-aways, local artists, great local food, live music on two stages and activities for people of all ages. Find us at the Miracle Mile Stage – We will be serving beverages at the Fountain Bar! 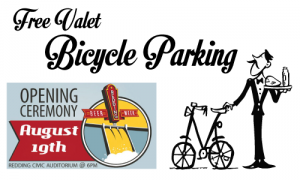 How can Shasta Bike Valet help your event be more successful? Attract the large number of individuals and families who live active lives and are looking for events and places to safely and conveniently ride. Let us manage bike parking for you. Keep bikes off of fences and out of trees. Remove security issues for your guests. Reduce traffic congestion and free-up more automobile parking by serving people who want to ride instead of drive. Showcase your organization’s commitment to community goals for excellence in active living. How does Shasta Bike Valet work? Our monitored bike parking is like a coat check for bicycles with controls and detailed record keeping. We locate the parking area in a convenient and safe place. Our staff and volunteers ensure bicycles are secure. We will promote your bicycle-friendly event to our members and supporters on social media and in our newsletter. Raffles, give-aways, educational activities and classes. Talk with our staff about this if you are interested. 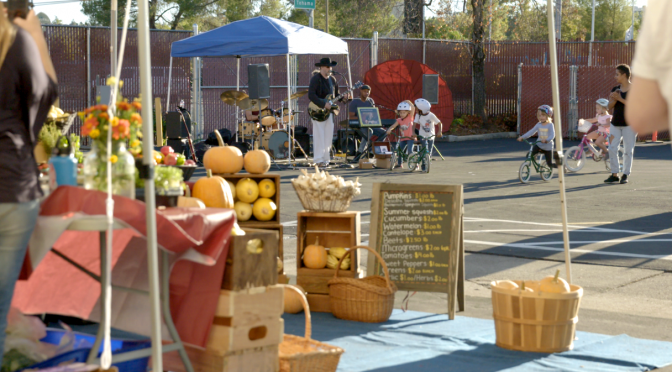 From April to December, we offer free Farmers Market Bicycle Valet at the farmers market. This service is made possible by generous sponsors, including Clif Bar Family Foundation. Sunday October 9 Sequoia Street 10:00 -3:00 p.m. Enjoy a trail through the city to celebrate safe routes and neighborhood greenways. Free to everyone. It’s an event like no other. It’s a bike, walk, skip, dance, skate, roll people-powered parade. Family Bicycling Day. It’s a trail through the city. On this day a stretch of the city is transformed into a car-free zone for Sunday enjoyment. Family, friends and neighbors meet and experience the neighborhood in a new way. Groups across the community come together to celebrate the Garden District neighborhood and complete-streets improvements that help local children walk and bicycle to school. 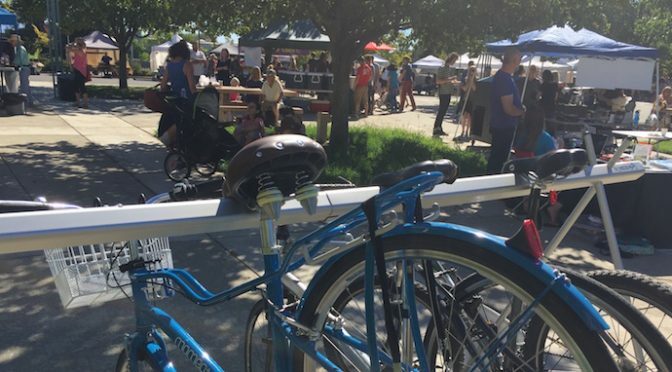 The stress-free streets created for this event allow area residents to comfortably walk and bicycle with family and friends and learn about places and neighborhood attractions previously unexplored. This gives people a way to see their neighborhood from a new perspective. Families enjoy a safe space to gather, play, ride a bike, dance and engage. Some people will ride a bicycle for the first time. Others will discover they can hula. All are inspired to get out and enjoy our beautiful local neighborhoods more often. Learn how our children can be more active in their daily lives with safe crosswalks, traffic calming, protected bike lanes, Walking School Buses, Bike Trains, Crossing Guards, and more! REDDING IS ON THE CUTTING EDGE. MAKING CONNECTIONS, INSPIRING CHANGE. Redding is one of the first cities in the nation to host open street events. Shasta Living Streets has produced open street events in Redding for six years in collaboration with local agencies and businesses. When we started we were one of 50 cities in the nation hosting these events to make connections and inspire change. Now there are 133 cities in the nation with open street programs. 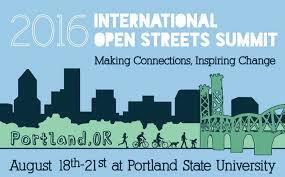 Last summer Anne Thomas was invited to present at the third International Open Street Summit. The story of Redding’s ongoing program in a relatively small city that has inspired improvements for safe routes for biking and walking, was one of the most popular sessions at the conference. 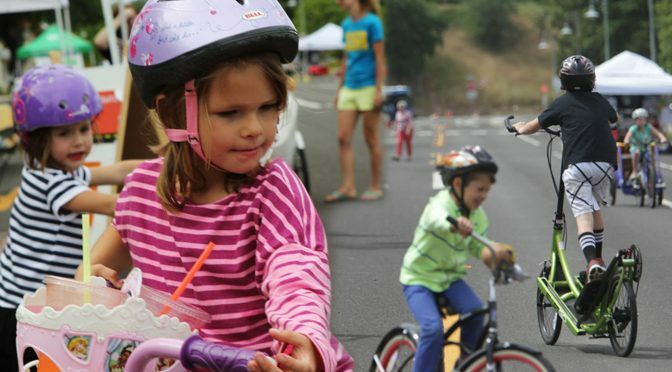 To create this free public event, Shasta Living Streets and Shasta Safe Routes to School partner to engage businesses and community groups from across the county to participate. Sequoia Middle School serves students in grades 6 through 8 as well as our 4thand 5th grade music magnet program. As a five-time California Distinguished School, Sequoia offers rigorous coursework, an award winning music program and competitive sports teams. The 4th and 5th grade music magnet program showcases strong academics with an emphasis in all music disciplines. For more information please call 225-0020 or visit the website at sequoia.reddingschools.net. This is an event where residents will be moving about in the neighborhood and on a street as they can do on any day, but in this case without automobiles on the road. People will be freely enjoying the neighborhood without the stress of car traffic. 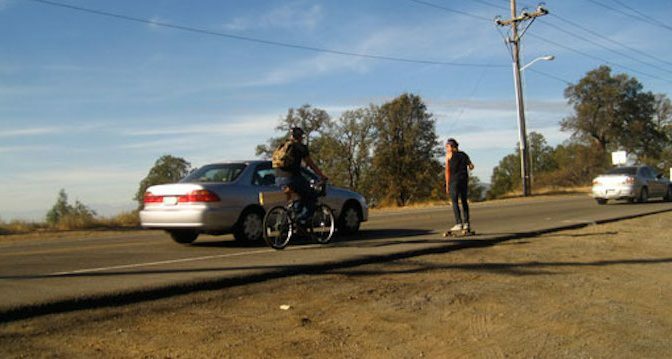 This greatly reduces risks that might normally exist on this roadway and allows people to walk, bicycle, skate and hula – freely and comfortably on a Sunday afternoon. It’s not just about bikes – you can walk with friends, skate, roll or dance. Throw a Frisbee. Show off that special bicycle: the lowrider cruiser, the cargo bike, the family bicycle train, or the fancy street bike. Bring someone who does not ride often on city streets. Decorate your bike. Enjoy the people watching. Street Games – feel free to bring your own! If you would like to add an activity, or have any questions, please contact Cassie at cmcaleer@shastalivingstreets.org or talk to a real person at 530.355.2230. 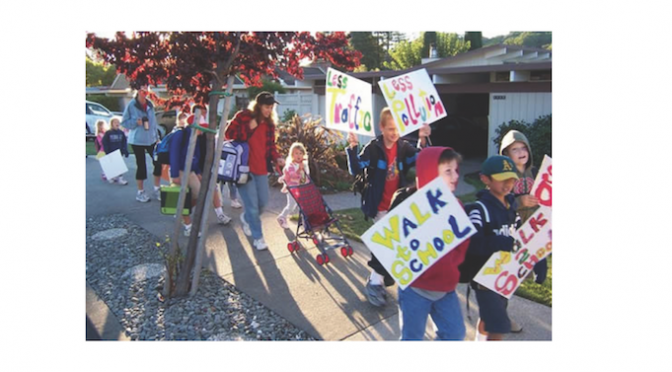 Redding children join walking school buses! 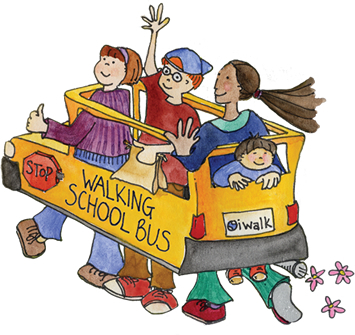 What is a Walking School Bus and how do children in your neighborhood get one? This year Redding School District will have walking school buses at Juniper, Cypress, Sycamore, and Turtle Bay. Shasta County has 37,000 children. One third of all families in Shasta County have children under the age of 18. Shasta County is ranked a low 56 of 57 counties for health indicators for all counties in the state. Walking one mile to and from school each day is two-thirds of the recommended sixty minutes of physical activity a day. Kids are less active today than in the past, and 23% of children get no free-time physical activity at all. Over the past 40 years, rates of obesity have soared among children of all ages in the United States, and approximately 25 million children and adolescents—more than 33%—are now overweight or obese or at risk of becoming so. Would you like to help children and families in your neighborhood walk or ride their bikes to school? Contact Shasta Safe Routes to School.